KIEV, Ukraine -- Ukrainian President Petro Poroshenko on Tuesday told the country's security council that staying out of the NATO alliance was a "criminal" policy that his government is ready to reverse. Ukrainian President Petro Poroshenko (L), and NATO Secretary General Jens Stoltenberg talk in a helicopter on the way to a military training ground outside Lviv, western Ukraine, Monday, Sept. 21, 2015. Stoltenberg arrived in Ukraine for NATO-Ukraine joint exercises. More than 8,000 people have died in Ukraine's fight against separatist rebels in the east since April 2014. Russia backed the rebels, fearing that the pro-Western course of the new Kiev government would make it a NATO ally. "The decision on the non-alliance policy which was announced by the previous government is criminal in terms of security and strategic interests of our state," Poroshenko said, citing an opinion poll showing 60 percent of Ukrainians supporting potential NATO membership. 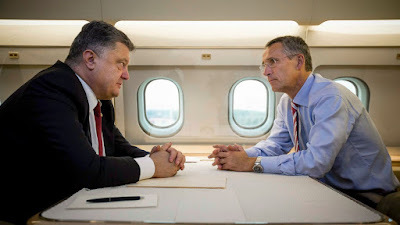 Poroshenko, who chaired the security council with NATO Secretary-General Jens Stoltenberg in attendance, said any decision to join the alliance will be subject to a popular vote. Before the February 2014 uprising which toppled pro-Russian President Viktor Yanukovych, the majority of Ukrainians opposed joining NATO, but many now see the alliance as their best defense from a foreign military threat. NATO officials say Ukraine needs to enact political, economic, social and military reforms to be considered for membership. Stoltenberg told the meeting on Tuesday that "Ukraine can rely on NATO" and that "NATO provides Ukraine with political and practical support." He lauded the Kiev government for sticking to the Minsk cease-fire agreements and called on Moscow and the rebels to respect the deal. Stoltenberg's visit comes less than two weeks before a summit in Paris where leaders of Ukraine, Russia, Germany and France will be discussing a political solution to the conflict. NATO has expressed firm support for Ukraine in its conflict with Russia, but alliance member states, including the U.S., have declined its request for offensive weapons. Poroshenko told reporters after the meeting that he may talk to other world leaders at the U.N. General Assembly next week about sending peacekeepers to eastern Ukraine. However, he said the cease-fire there seems to hold, giving him hope that peacekeepers won't be needed.